Vega Vitamins Zinc Citrate has more than 300 enzymatic and metabolic reactions in the body. Zinc maintains the body`s immune, nervous and reproductive systems. It is essential for normal growth and development. Zinc maintains healthy vision, skin, nails, taste and smell. Heavy drinkers, the elderly, diabetics, those with gastro-intestinal disorders, people with poor health or diet, pregnant women, vegetarians and vegans may have an increased dietary requirement for zinc. Vega Base (Acacia Gum, Fruit Juice Concentrates (Aronia, Apple, Elderberry, Blueberry & Blackcurrant)), Zinc Citrate, Vegetarian Capsule Shell (Hydroxypropyl Methylcellulose, Colours (Titanium Dioxide, Copper Chlorophyllin)), Anti-caking Agent (Magnesium Stearate). As a food supplement for adults, take 1 capsule daily or as directed by a healthcare professional. Do not exceed the stated recommended daily dose. Store in a cool dry place, away from heat, light and moisture. If you are pregnant or breastfeeding, consult your doctor before use. 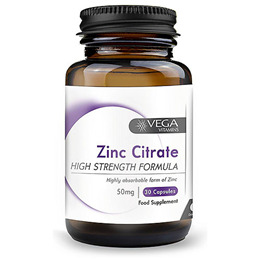 Below are reviews of Vega Vitamins Zinc Citrate - 30 x 50mg Capsules by bodykind customers. If you have tried this product we'd love to hear what you think so please leave a review.